Did Alex Burrows taunt Mike Richards about recreational drug use? 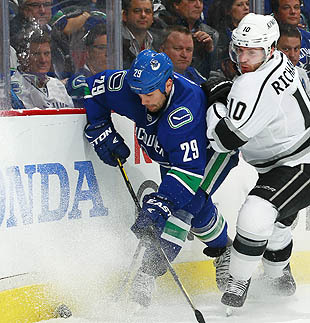 It's no secret that Mike Richards of the Los Angeles Kings was a disruptive force in Game 1 of the Western Conference quarterfinals against the Vancouver Canucks: one goal, two assists and countless moments of drawing their ire. It's also no secret that Richards has earned a reputation for an alleged party lifestyle during his days with the Philadelphia Flyers. Two words: "Dry Island." After the Kings' Game 1 victory, a rumor swept through social media that Alex Burrows of the Canucks had targeted that reputation with an inventive late-game taunt. In the aftermath, while waiting for the faceoff, Burrows scooped up snow with the blade of his stick. He began flipping it, and then, cradling his pile of snow, he pointed the blade toward Richards. Many saw it as him poking fun at some, well, alleged lifestyle choices. An official thought it offensive enough to jump in the middle, putting a stop to it. Jumping to conclusions? Consider the other video over on PITB from earlier in the sequence, as Burrows gets into it with Richards and drags his glove under his nose twice. Glove under the nose, offering a pile of snow to Richards … yeah, we're going to go ahead and hazard a guess that this wasn't about an antihistamine. Let it also be said that, if true, Burrows is one nasty, funny little S.O.B. This is priceless, Chirp Hall of Fame stuff. Game 2 is Friday night.